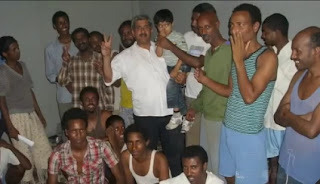 Eritrean B.General Teleke Mengus sells Eritrean refugees to Arabs as medical spare parts The head of the Eritrean Boarder Surveillance department B. General Tekel Menejus with his colonels control the human trafficking and body part commercialization of Eritrean refugees. In the past the Eritrean soldiers were ordered to shoot escaping Eritrean to the neighboring countries with live rounds, but now the cash them and sell them to Bedouin. The Main head for such enterprise is Col. Fessum who supposedly heads the Ethiopian opposition movements in in the western areas is the key ally of the Bedouins for such highly lucrative body part market in the Arab world. Every week of thousands of Eritreans are sold to the Bedouin tribes known as Rashid’s dispersed in Eritrea, Sudan, Egypt and Arabian Peninsula. They are known for their as nomadic businessman. They sell anything starting from petrol, foodstuff, electronic, car spare parts and arms. Te most lucrative is Human trafficking. I'd like to offer my graphic services. I'd like to work for you. If you like my work get in touch, I look forward to working.